These are special small-group charters – SIX divers max. We get our own very convenient 3-bedroom accommodations for four nights, and our own boat for 3 days of two-tank diving – no hassle with crowds, plenty of fun easy personalized diving. 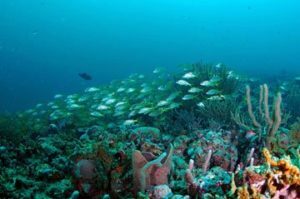 We book this through Quiescence Diving – a well-established dive operation in Key Largo specializing in small groups and six-pack charters – NO CATTLEBOATS. We’ve taken well over 100 divers on this trip in the last few years. Ask around – they’ll tell you it’s great! 4 nights accommodations in the very roomy guest quarters (full kitcken, patio, barbecue grill, etc. ) at Quiescence Diving, including all taxes. This is a perfect trip for earning your DEEP DIVER or WRECK DIVER certification. Full payment due at time of reservation. Space VERY LIMITED! Questions? email or call Billy at 919-255-1931. For dive travel insurance Gypsy Divers RECOMMENDS DiveAssure or DAN.